According to Isaac Newton, “Absolute, true, and mathematical time, of itself, and from its own nature, flows equably without relation to anything external, and by another name is called duration.” Today most people think like Newton – that clocks measure linear time and that orbits are clock-like. Newton also claimed that space was unchanging in nature. Gottfried Wilhelm Leibniz’s disagreed with Newton. For Leibniz, space and time are NOT substance-like. Leibniz saw time as the “order of successions” and space as the “order of co-existents.” Both men were mathematical geniuses, since they independently invented calculus. Leibniz wrote to Newton’s friend Samuel Clarke, “without the things placed in it, one point of space does not absolutely differ in any respect whatsoever from another point of space.” This is different from today’s cosmologists who speculate that ancient space-time stretches out the vacuum of space differently from modern space-time. Where do they get such absurd ideas? Einstein conjectured that space-time bends the geometry of a vacuum and that the Earth follows, like a train on rails, the bends in the vacuum. Both of these theories violate Leibniz’ claim that vacuums are devoid of properties. 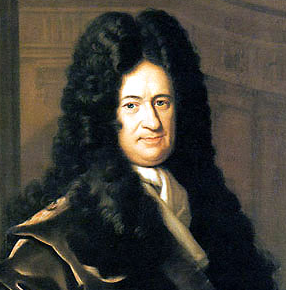 Leibniz thought everything is made of monads: “the true atoms of nature . . . the true elements of things.” Monads supposedly are tiny things that are programed to internally, continually change. Please notice that Newton and Leibniz approached physics using the opposite assumptions. Newton has a static view of matter and Leibniz a dynamic, emerging view of matter. In a universe where matter is continually changing itself, calculus formulas can successfully work only in the near term and nearby spaces. Why is that? Many calculus formulas treat time as an independent variable and use clocks to “measure time.” If matter continues to change relationally, those same formulas always fail because ancient atoms tick at much lower frequencies than modern atoms. We also observe in the history of galaxies how orbits also accelerate as galaxies intrinsically grew. Visibly, the the properties of matter continue to change relationally. The biblical prophets did not speculate philosophically about the nature of time. Biblical Hebrew did not have a simple word for time nor did it have tensed verbs. God continued to form the heavenly bodies (imperfect verbs) on the fourth creation day. The Sun, Moon and stars were to shine on Earth and serve as markers for days, season and years. The ancients used the cycles of the heavenly bodies, and related changes in nature, as markers for days, seasons and years. The Hebrew text says God continued to form the heavenly bodies as things that spread (raqiya). Orbits that spread out cannot be linear because they accelerate, relative to their previous cycles. The records from the ancients show that the earliest people lived through vast geological changes in few days (see Job 14). Over the centuries, astronomers measured (with angles) a decreasing solar parallax as though the entire solar system is gradually expanding. What did He continue to form the Sun, Moon and stars from? First God completed the creation of the plural heavens and earth. However, the earth was dark and formless until Elohim continued to command light to continue to be. It was light that gave extension to the formless earth. Indeed, light dithers around within all substances, evidently giving them extension. At the Stanford Linear Accelerator, colliding light beams produced electrons. When electrons and positrons meet, they convert to light. Whenever “sub atomic particles” are shattered, we find light-like things all the way down. No one has ever discovered anything that is not related to light. The Bible states that all that is visible (matter) is light (phos estin – Ephesians 5:13). Biblically, matter is a relation with light. Apparently the Sun, Moon and stars were formed from the formless stuff created on the first day. We confirm that this is the proper interpretation because we observe the creation era with telescopes. Billions of galaxies intrinsically grew from tiny naked globs to huge, local, growth spirals. He calls the stars to come out, in unbroken continuity, yet none go missing – Isaiah 40:26. A scientist might insist that orbits are clock-like and clocks are linear. We measure billions of years, claims the scientist. No! Your system of measuring is founded on the notion that atoms dither with perpetual motion. Yet we observe that ancient atomic clocks clocked tiny fractions of the frequencies of modern atoms. We also observe how the star streams accelerate outward, concurrently with the accelerating clocks, as billions of galaxies grew into huge, local growth spirals. What is visible is a violation of the creed of all scientists. This is certainly why they fill the universe up with magical things like invisible matter, vacuums that stretch themselves and space time. What is visible in cosmic history is anathema to a scientist, since their structured way of thinking, measuring and mathematicating follows Newton assumption that all things intrinsically remain the same. Lift up your eyes and observe cosmic history and you will see the evidence that the Bible will triumph over science. Even the calculus fails in a universe where there are no independent variables, where matter continues to change itself relationally as a relation with light.